Paper editions are available from all good physical bookstores. 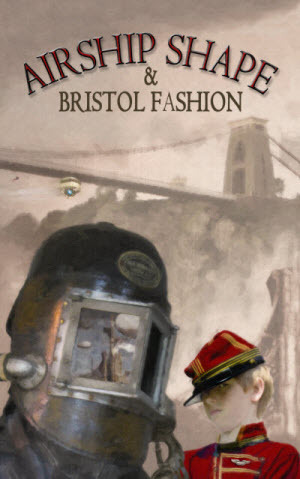 Airship Shape & Bristol Fashion brings together tales from the light and dark sides of steampunk. Living ghosts, walking ferns and ingenious androids populate visions of the city of Bristol at once familiar and peculiar. Above them soar magnificent men, and women, in their flying machines. Whether they are seeking release, revenge or adventure, the characters in these stories will draw you down the side-streets of Bristol to the brass and steam-filled worlds you never dreamed were there. Edited by Roz Clarke & Joanne Hall. This book is produced in collaboration with the BristolCon Foundation. It is a charitable organisation responsible for the running of the BristolCon SF & Fantasy convention, which takes place in Bristol every October, and a series of Fringe Events intended to promote local genre writers and artists. Airship Shape & Bristol Fashion is the Foundation’s first short-story anthology supporting this mission. Wizard’s Tower Press is delighted to be supporting the BristolCon Foundation in this project.